A compulsory computer test for teenagers in England has been abolished, ministers have confirmed. 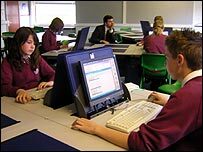 A statutory test in ICT (information and communication technology) for Key Stage 3 pupils (14-year-olds) was due to be made compulsory from 2008. Schools' results were to be published in the national league tables. But the Qualifications and Curriculum Authority had raised concerns about the increasing burdens on schools and ministers agreed to drop the test. The Department for Education and Skills is now working with the QCA to evolve the exam into a "formative test for ongoing assessment", rather than a statutory test. A spokesman for the DfES said: "Our main priority is raising standards in ICT and we have decided that testing for progression is the best way of achieving this. "The test is a pioneering onscreen e-assessment and has huge potential to be used more flexibly throughout the key stage. We now want to equip teachers with an additional formative tool to help them check students' progress and confirm that they are ready to move on to the next level. "We will be revising the test and more detailed advice will be sent to schools in the next few weeks." But head of information technology (IT) at Rugby High School for Girls, David Cooper, contacted the BBC News website to say the change of heart was a waste of taxpayers' money and of teachers' time. 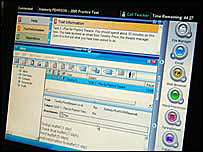 "I am appalled at the mess over the KS3 ICT tests mess, effectively abandoned today," Mr Cooper said. "Believe me when I tell you that no head of IT in their right mind is going to use these to aid assessment - it takes months just to teach pupils how to use the totally non-standard interface. "As a head of ICT, I know how little they have been thought of by teachers trying to implement them ever since they came out." The change of heart was welcomed by the NASUWT teachers' union. "The last thing we needed was another high-stakes accountability test to feed performance league tables," said general secretary, Chris Keates. "The promise of delivering assessment in other ways is interesting and merits exploration, but there must be an accompanying commitment to ensuring that the workload of teachers and the bureaucratic burden on schools will not be increased. "There will need to be stringent safeguards against the focus on technology leading to an assumption that teachers will be accessible 24 hours a day, seven days a week, an attitude which already blights and pervades too many workplaces across the country."